In the vicinity of the now abandoned Turkish-Cypriot village of Agioi Heliophotoi (or Agioi Iliofotoi), the small Chapel of the Heliophotoi Saints (also known as Aliphotes) can be found. Administratively, as with all the region, it belongs to the village of Kato Moni. The names of the Heliophotoi Saints according to the way they are written on their icons are as follows: Epaphroditos, Ammonios, Houlelaios, Ephsthenios and Heliophotos. Heliophotos was their leader, who was also a priest and their spiritual father, and he is presented in the icons blessing and holding the Gospel. 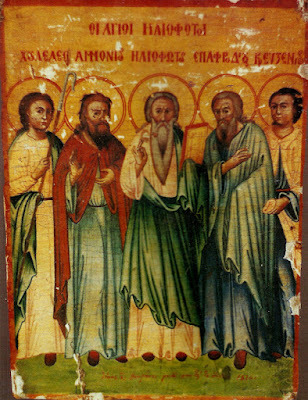 It is from him that the rest of the Saints took their name from and are known as Heliophotoi (plural for Heliophotos) among the people of Cyprus. Ephsthenios and Houlelaios were shepherds, which is why these two are presented holding shepherd's sticks, and the others helped them in the milking. According to historical tradition these Saints were among the three hundred Alamani, Christian refugees who came to Cyprus after the Second Crusade, after their boat was crushed in the waters of Paphos, from the waves. These Alamani Saints were scattered on the island and they continued their hermit life in the parts of the island which they chose to go. Therefore, after the Heliophotoi came to Cyprus, and they roamed around the island, they went up to the mountain of Koroni, a mountain near the village of Kato Moni. There, they set up their hermitage in two caves, which they found at the top of the mountain, and made a water spring which exists up to this day. Their sheep and their goats multiplied daily and came to be counted in the many hundreds, something which can be confirmed by the large area of land where they kept their animal pens. These animal pens still survive to this day in the village of Kato Moni and are known as the "Holy Pens of the Heliophotoi Saints". They survive along with the stone milking places, which they carved above in the rock, along with the ditches which transported the milk from the milking places which brought all the milk together in one big stone pool. In all its extent, their land is calculated to have been roughly around twelve acres. When the Cypriots learned of the arrival of the Saints, they visited them often to receive spiritual advice, and the Saints in return not only gave them spiritual food, but also gave to the poor of the region their dairy products. 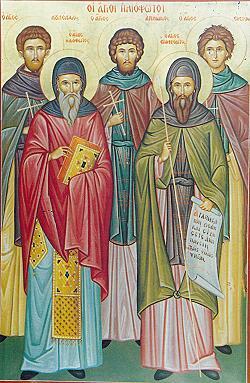 According to tradition, when the sovereign of the island who went by the name of Sabinos learned about the Saints, he called them to him, asking them to deny Christ. The Heliophotoi Saints, with courage confessed their faith in front of the sovereign, who in return ordered for them to be whipped mercilessly, cutting their flesh, and in the end he cut off their heads. The faithful afterwards buried the bodies of the Saints in the two caves, two in one cave and three in the other. They were found after many years due to the many miracles that were and are still taking place there. After many years had passed by, the faithful of the region built a small church in their honor. 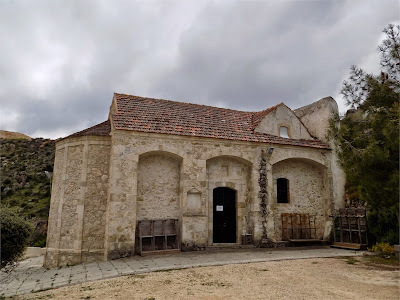 This chapel dedicated to the Saints with the passing of time had evolved into a monastery, which again was destroyed and now only their church exists, rebuilt in 1750. In the place where now the village of Kato Moni is (in Greek it means "Lower Monastery"), there used to be another monastery and was called as such, in order for it to be distinguished from the "Upper Monastery" (Pano Moni) of the Heliophotoi Saints. A portable icon of the Heliophotoi Saints, which was painted in 1874, exists in the new Church of the Panagia of Chrysopantanassa in the village of Malounta in Nicosia, next to which there is also a very white colored skull, which according to local tradition, they were both transported to the village of Malounta many years ago by a monk, who abandoned the hermitage of the Heliophotoi Saints, and took residence in Malounta. The memory of the Heliophotoi Saints is celebrated on July 13th with a big festival that takes place at their church. Portions of their relics can also be venerated at Dionysiou Monastery of Mount Athos and Kykkos Monastery in Cyprus. 1. In the village of Malounta there was a priest who suffered from time to time in his hands. They were filled with warts. For treatment he resorted to many physicians of his time but the result was disheartening. In the end the priest took refuge in the Heliophotoi Saints. He made a vow and with piety went to receive their grace. There he was very sad to notice the sacred skulls of the Martyrs were missing, along with a large part of their holy relics. Though saddened he prayed and lay down to rest. When he fell asleep, he saw coming towards him five men, who stopped in front of him and with a sweet voice said: "Elder, we understand your grief. But take comfort. Even if our relics were stolen, our protection has not been lost. Go, make a wooden-box and place within it what remains of these, and you will receive what you desire." The priest did as the Saints ordered. When he returned and began to place in the box the remaining relics, the miracle took place. His hands were healed. 2. A devout woman from Nicosia was suffering from an incurable illness. She resorted to the grace of the Saints, attended Liturgy, and at the end the priest blessed her with the wooden-box that contained the sacred relics of the Saints. While the priest was crossing her, the woman was completely healed. The brave Martyrs of the Alamani, who renounced all things on the earth, let us come together and praise as bright stars, Heliophotos, Epaphroditos, Ammonios, Houlelaios along with Ephsthenios, decking with garlands, honoring the five in number chorus.